The long-held belief is that Nintendo game designer Shigeru Miyamoto rides his bicycle to work and doesn't make more money than other Nintendo designers. Part of Miyamoto's image is that he's just a regular guy! And that he doesn't take a larger salary than other employees, as Giant Bomb put it, "in order to prove an equal to his fellow designers". He is not an equal. He is Shigeru Miaymoto. And let's face it, without him, Nintendo would not be Nintendo. 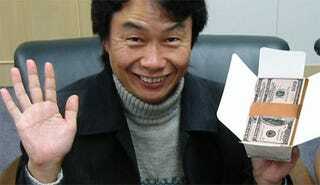 Still, in a 1999 interview with the Daily Telegraph, Miyamoto stated, "Nintendo only pays me a salary. So why don't you in your article ask everyone who has enjoyed my games to send me 10p to my account!" Starting March 31, a new regulation now requires Japanese companies to disclose the salaries of employees over ¥100 million (US$1.1 million). Executive salaries in Japan are lower than the astronomical compensation execs receive in the West. "Companies owe their existence to society," says Shizuka Kamei, the Japanese politician who spearheaded the regulation. "People who are paid a lot should be proud of themselves and the job they do." According to the Yoimiuri Shimbum, the average salary of execs working at listed Japanese companies is approximately ¥25 million ($280,000). So how does Miyamoto compare? The Asahi Shimbum lists a total of over $1.1 million (¥100 million) last year paid to all six Nintendo Representative Directors. Included in that is Shigeru Miyamoto. That is grand total of over $1.1 to all of them. Divided evenly, that would be $183,333 each, which is not the typical Nintendo company salary Miyamoto spoke of in 1999. No word on how that $1.1 million plus was split between the six Nintendo representatives. For comparison's sake, Nintendo President Satoru Iwata made ¥187 million ($2.09 million) last year. Iwata's base salary is ¥68 million ($760,000) — significantly higher than the average for an Japanese executive. Nintendo, of course, is not an average company. Iwata received the rest in performance-based bonuses. Granted, Nintendo should probably pay Miyamoto ten times what they already are. He has created so many of the company's iconic games and characters. Meanwhile, former Nintendo president Hiroshi Yamauchi is one of the richest men in Japan. Somehow that just doesn't seem right. Eds Note: The wording in the sourced report was somewhat unclear. Nintendo has released detailed data regarding the salaries of Nintendo's Representative Directors.